We specialize in horse-quality alfalfa and orchard grass hay since 1995. 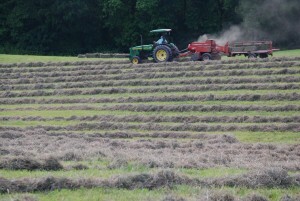 Orchard grass is mowed, then fluffed to help it dry evenly, then raked into windrows and then baled. It’s picked up from the field and stacked in the barn. Horses need a minimum of 1% of their body weight in forage in order for digestion to work properly. That’s 10 lbs of hay for a 1000 lb horse. Remember that’s only a minimum, and the best equine diet is free choice forage. Hay should be clean and free of dust or mold. Color is not always an indicator of nutritional content. 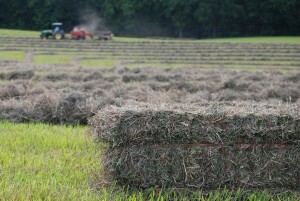 Hay should smell fresh and slightly sweet. 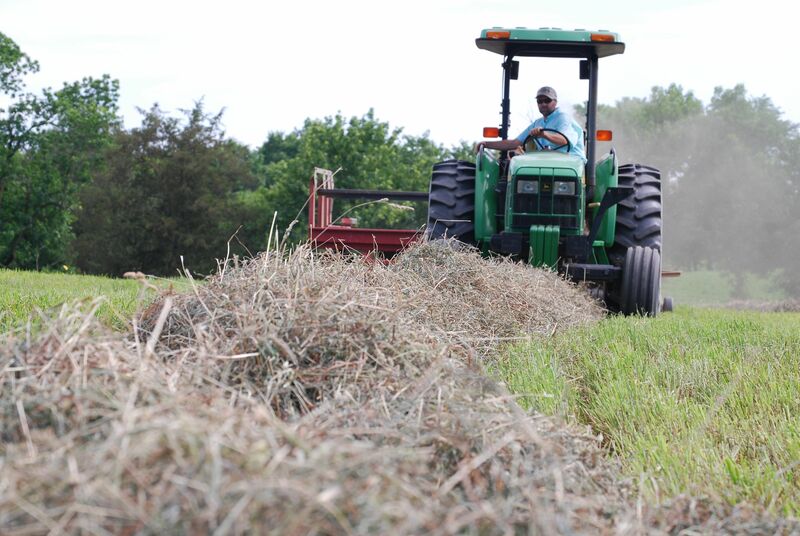 Orchardgrass and Timothy are excellent grass hays and very similar nutritionally, followed closely by bermudagrass. Fescue is generally much lower in protein and nutrients; alfalfa (a legume) normally has the highest amount of digestable protien and nutrients. Basically you would need to feed more fescue than orchardgrass, and more orchard than alfalfa, based on how much nutrititive value is in the hay. This is why fescue hay is generally priced lower than orchard or timothy, and why alfalfa hays are usually the most expensive. It is normally not recommended to feed fescue to pregnant mares in the last 60 days of gestation. Do the research to determine your horse’s nutritional needs. 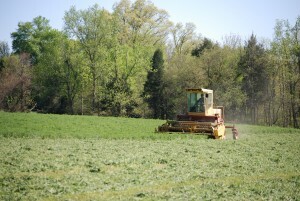 Alfalfa hay requires a special kind of mower. 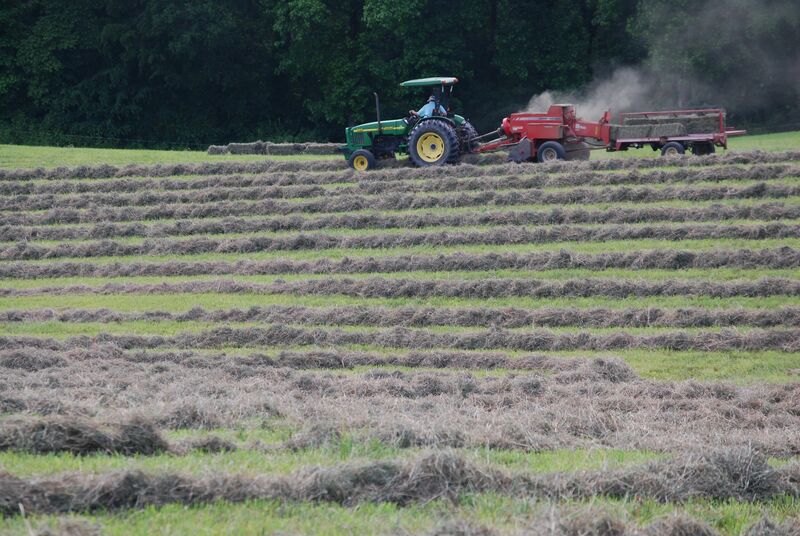 Shane makes round bales to feed our cows and horses in the winter. He normally doesn’t sell round bales. 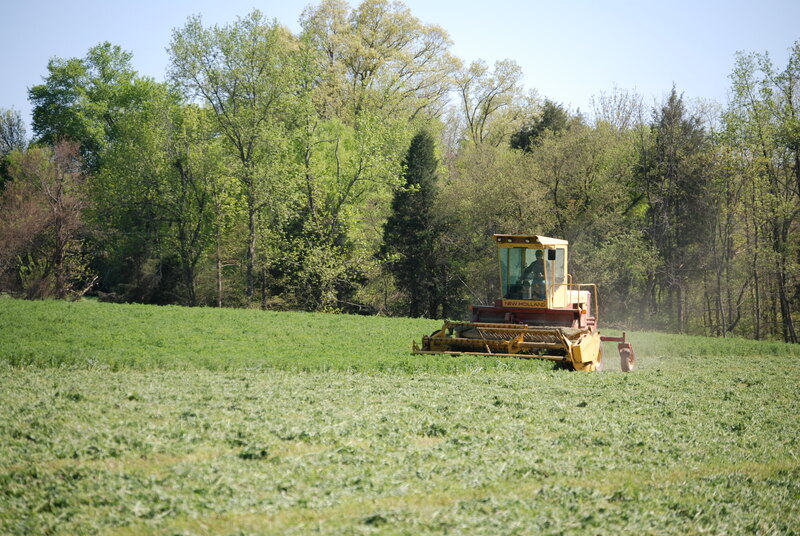 Our alfalfa square bales are $10 and average 65 lbs each and orchardgrass is $8. We always run out so be sure to stock up for winter, BEFORE winter arrives! 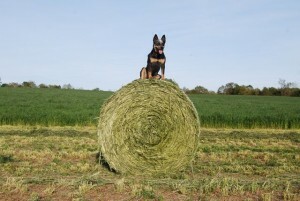 We are no longer able to deliver hay due to our workload. 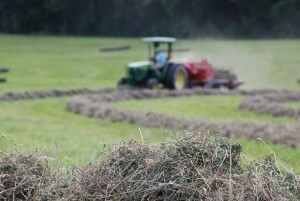 Pick-up at the barn is a minimum of 30 bales and pick-up days are Friday and Saturday. Please call Shane at 704.699.2208 to schedule a pick-up.